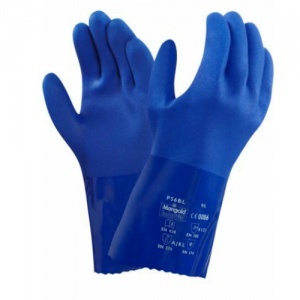 Manufactured from a cotton liner with a full, soft PVC coating, the Ansell VersaTouch 23-200 Supported PVC Gauntlet Gloves provide flexible, liquid-proof protection with excellent abrasion resistance for a wide range of applications in the chemical, electronics, food, janitorial, pharmaceutical and life sciences industries. The 23-200 Gloves have a rough finish to promote good grip when handling wet or slippery components, and this enables safer handling of tools and materials, as well as reduces hand and arm fatigue. The VersaTouch 23-200 Gloves are fully-coated with soft PVC to provide liquid-proof protection. Due to the flexible nature of this coating, the 23-200 Gloves provide excellent dexterity and cause less hand and arm fatigue than similar, more rigid gloves. This PVC coating maintains dexterity and pliability at low temperatures, making these gloves suitable for work in cold environments. A rough, sandblasted finish on the 23-200 PVC Gauntlet Gloves enhances user grip. This texturing enables the user to handle wet or slippery objects with greater ease and promotes safer handling. The table below shows the test results of the 23-200 Supported PVC Gloves according to EN 388:2003 Mechanical Risk specifications.